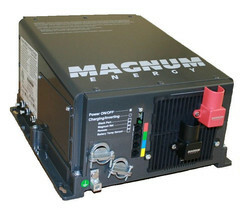 The ME2512 12VDC inverter/charger by Magnum Energy is designed specifically for RV use. The power-factor-corrected battery charger efficiently charges your batteries even at low AC voltage from low-cost generators, while the modified sine wave inverter keeps the cost down. Additionally, the battery temperature sensor works with the charger for optimum battery charging. It comes in three power levels. ME2512 is ETL Listed to UL/cUL 458 for RV, marine and mobile use. 3-year warranty. Dimensions: 16.6 x 8.4 x 4.7 inches. Mount the ME Series on a shelf, bulkhead, or even upside down. The ME Series provides multiple ports, including an RS485 communication port for network expansion, and a remote port. The extra large AC access cover with terminal screw block and 360° DC connection terminals with covers make this inverter more accessible when it needs to be. The ME Series comes with an on/ off inverter-mounted switch with an easy-to-read LED indicator.